Welcome to ICSOC-ServiceWave 2009. 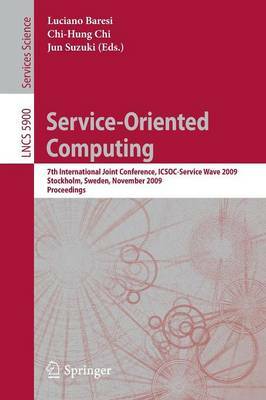 This volume contains the research and demopapersselectedforpresentationattheSeventhInternationalConferenceon Service-Oriented Computing, which was held in Stockholm, Sweden, November 24-27, 2009. Continuing the tradition set in the previous six years, we are pleased to present a high-quality technical program.This year ICSOC ServiceWaveworked together to convey a world-leading and unique opportunity for academic - searchers and industry practitioners to report their state-of-the-art research ?ndings in service-orientedcomputing. The joint conference aims to foster cro- community scienti?c excellence by gathering experts from various disciplines such as distributed systems, software engineering, computer networks, business intelligence, service science, grid and cloud computing, and security. Consistent with the high quality of the conference, we received 228 paper submissions from a number of di?erent disciplines. Thirty-sevenpapers were - cepted as regular contributions, for a very competitive acceptance rate of 16%; eight further submissions were accepted as short papers. The programalso c- prisedninedemonstrationsofinnovativetoolsandprototypes.Alltheseelements contributed to a program that covered the many di? erent areas of the discipline and provided an up-to-date synthesis of the researchon service-orientedsystems and applications.